Diesel Fuel: How It is Made? What are its advantages and disadvantages? This fuel got its name from German mechanical engineer 'Rudolph Diesel'. He invented ‘Compression Ignition’ technology that uses it as fuel. Firstly, the oil companies extract the crude oil thru' the oil rigs. 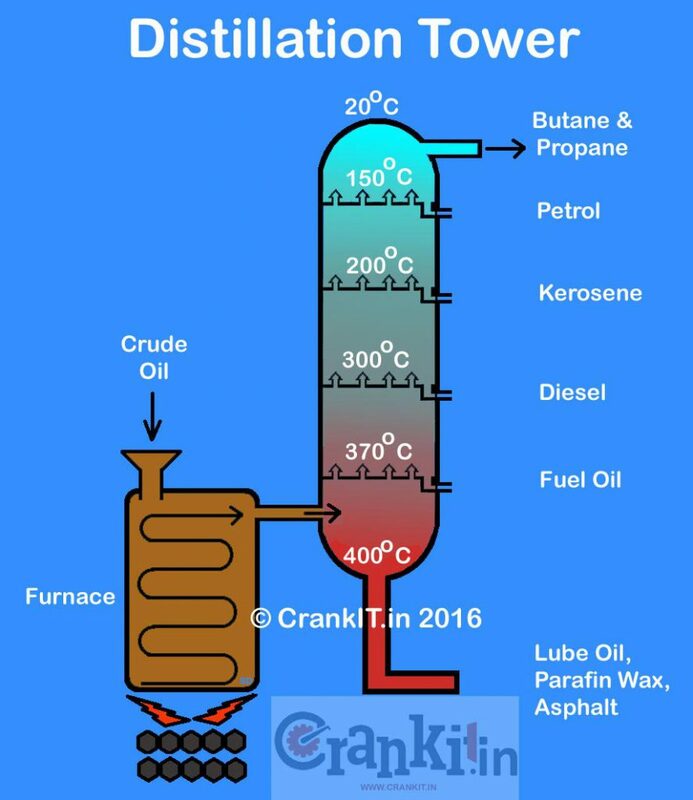 The refineries then carry out fractional distillation of the 'Crude Oil' (see diagram below). First, the 'Crude Oil' which contains the dieselfuel is extracted from the oil wells. Then, it is heated up in a furnace. Thus, the fuel separates between around 300°C and 350°C. The refineries then collect the dieselfuel and store it in the barrels. They then transport the same to various dealers/outlets. Being denser as compared to the petrol, the diesel-fuel carries more volumetric energy density. Unlike rich burning petrol, the CO2 emissions from the dieselfuel are marginally small because it is a 'lean-burning' fuel. It contains about 15% more energy. It also returns extra miles than the same amount of petrol fuel. Mainly, 'Compression Ignition engines' use diesel-fuel which operate the commercial vehicles carrying heavy loads. In automotive, most cargo trucks, buses, tractors and construction equipment have engines such as Direct Injection, In-Direct Injection and Common Rail Direct Injection which use the dieselfuel. Some cars and small trucks also run on it while some generators use dieselfuel engines to produce electricity. However, burning of dieselfuel without particulate filters generates harmful 'soot' and NOx emissions. Hence, some environment protection groups term it as the 'dirty fuel'. The dieselfuel sold earlier contained a high amount of sulfur which produces harmful emissions. This affects human health to a great extent. So to reduce the sulfur content, the United States Environmental Protection Agency (USEPA) implemented strict rules in this regard from 2006. According to the regulations, the sulfur content in All the dieselfuel sold in the United States must be under 15 parts per million. Petroleum based- Extracted mainly from the fossils. Synthetic based - Produced from carbonaceous materials such as biomass, biogas, natural gas & coal etc. Biobased - Obtained from vegetable oil or animal fats. Home » Technical Anatomy » Diesel Fuel: How It is Made? What are its advantages and disadvantages?